Using BizInt Smart Charts for Clinical Trials (which is included in the BizInt Smart Charts Drug Development Suite), you can create clinical trials reports from ClinicalTrials.gov (starting with Version 3.3.17, Nov 2009). On 19 June 2017, the NIH released a new interface for the ClinicalTrials.gov website. While the content of the registry has not changed, the web interface has. There are now two XML exports - follow the instructions below to download the correct format. Do your search on ClinicalTrials.gov. From the List Results window, click the Download button at the top of the results list. The new Download Search Results panel appears. 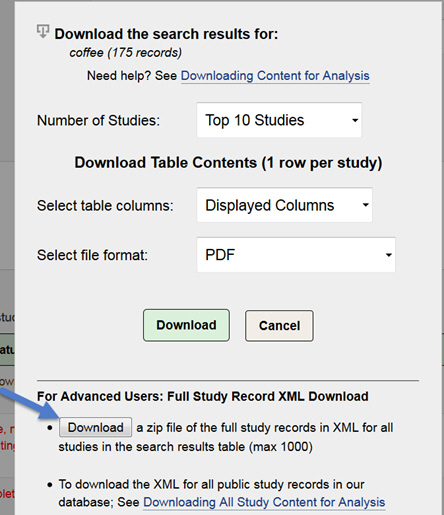 Find the "For Advanced Users" section and press the Download button (indicated with the arrow below). Use File|Import to import the .zip file into BizInt Smart Charts. Note: do not unzip the .zip file and import files individually -- import the .zip file itself to import all the documents.